I'm also 5'10" and my wife and I lake the back seat down and put one of those foam things that u put on your mattress to make it softer and it looks like it should hold eggs or something. But we lay that and a blanket on that and we have had some of our funnest trips camping in Maine and NH doing that and we fit comfortable in it. Most nights are spent boondocking in our Limo Bus but we have stayed a few nights in the Jeep. The Jeep is towed by the Bus and quickly detaches in under a minutes for exploring remote trails and backroads. We have a 2 person Pup tent and full camping gear in rear of JKU. Pitch Tent, throw gear from Jeep into Tent and sleep in the climate controlled Jeep. This beautiful trail ended at a very remote Lake Superior Beach, where we slept in the JKU. I'm 6' and have the front runner interior rack in mine. I've moved the gear onto the interior rack, folded the middle row flat, stuffed a towel in the crack, and slid the front passenger seat forward. With a 3" thick sleeping bad I slept way better than I would have in the crazy wind outside. But as others have said, the folded seat is at a slight angle. It's not uncomfortable since you're entire torso is on that angled part. Now I'm considering adding a short drawer system that would let me create a flat platform with the folded seat. Being able to sleep in the Jeep is awesome when you're solo. Especially in foul weather and on fast paced expeditions where you roll into camp late and break down camp early each day. Plenty room, wouldn't work too good ina 2dr. I don't sleep in mine, but we've got a family of 4 in my JKUR. If I were alone, I might, but would rather hammock hang or tent it, personally. Was in the desert, and the winds came up really strong. People had their tents blowing around. I had the lee side windows opened slightly and used some fleece throws over the roll bars to mitigate dust and wind. Used a piece of tempered board over the gap, and a self inflating sleeping pad (to go along with my self inflated ego... lol). I just use 2 sleeping pads to get it flat. Just fold one pad to half length at the foot end towards the tailgate and then use one sleeping pad above at full length and You get a flat sleeping platform. If You look at my video here, You will see at 1.03 a red folded air pad at half length that maybe reaches maybe to my hip or so and above the red folded air pad I have a gray full length air pad above it. You may have to test different thickness of pads to get it right. 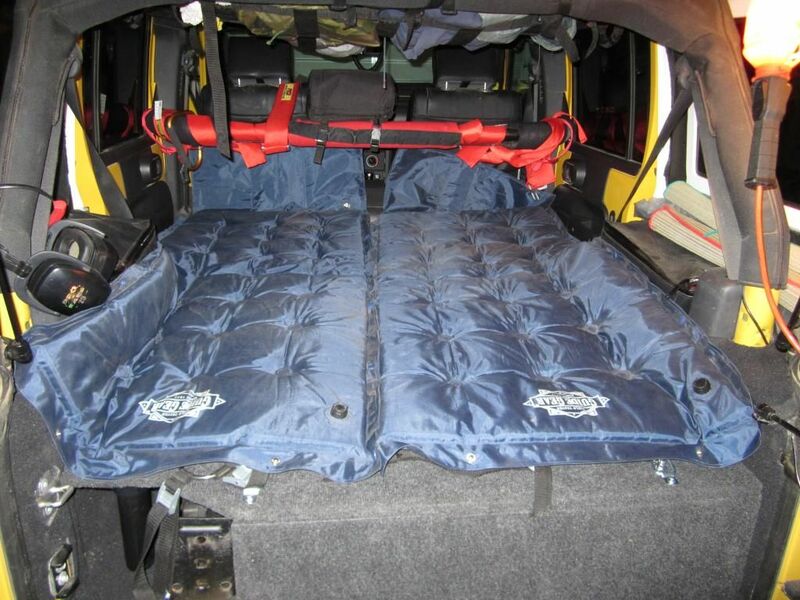 They grey air pad is a Exped Downmat Lite 5 M and is nice and take very little space. The red one in the movie is a 20 year old thermarest air pad. The blue big one is one of my old air pads and they grey small is the Exped. You can probably fit 4 exped air pads under the front seats, or maybe even more. 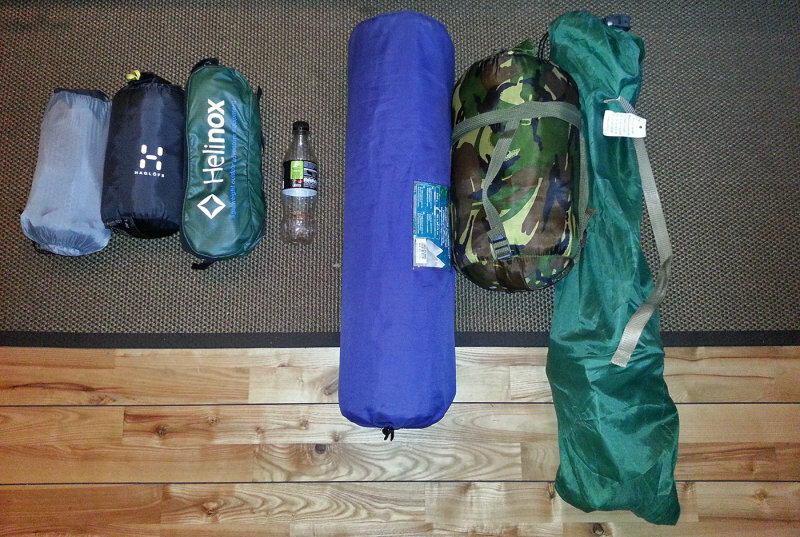 To the left new stuff, exped air pad, sleeping bag, Helinox chair to the right the old stuff in the same order. If You are 4 people multiply that package size with 4 so You will save a lot off space and weight with "hightech" stuff. Is that panel a stock size or did you cut it? Do you have a link to it somewhere? On other vehicles I've just used the rain guards on the windows while sleeping but it doesn't help with bugs. That's what I used to do in my TJ. There was about 6.5' from dashboard to tailgate. It was a bit tight between the center console & roll cage - but manageable (I'm not skinny). If I (and a few others, I'm sure) could do it in a TJ, I'm certain it could be done in a JK.